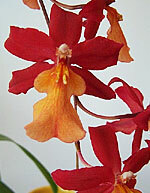 Renowned species Cochlioda, Miltonia, and Odontoglossum were crossed to produce this magnificent hybrid called Vuylstekeara. Created in Belgium by a famous orchid hybridist C.Vuylsteke, this trigeneric genus has gained steadily in popularity since its introduction in 1912, and it's not hard to see why. 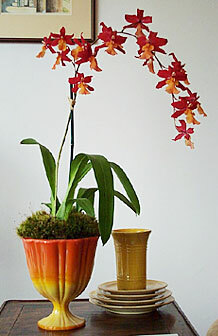 Manhattan Red produces long lasting, very colorful and neatly arranged on erect to arching racemes of exquisite flowers. Manhattan Red provides an exotic accent that would look just as good in a Southwest-style setting as it would in an Asian-theme or Ikea Postmodern room. 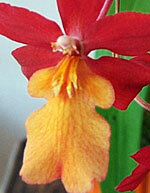 Best of all, we found this orchid to have a pleasant scent, which adds to its delightfully edgy character. From base line to top petals, the orchid stands at approximately 20-30 inches tall. The blooms (10-15 buds, as shown) measure 3.5 inches in length.